It's time to unveil our Limited Edition Field Day Winter Christmas candle...a most wonderful fragrance for the most wonderful time of the year. Epitomising cosy nights by the fire with mulled wine and the company of family and friends, our winter Christmas candle comes in two sizes, our boxed Large Jar candle with 40 hours burn, retailing at £13.95 and our stunning Extra Large candle Jar with 3 wicks and over 100 hours burn time, retailing at £37.95. The latter comes in a gorgeous lidded box and is wrapped in tissue paper. For Winter 2017, we've redesigned our boxes to include rich red edging and sprigs of holly...making both the Large Candle and the Extra Large 3 Wick Candle the perfect gift for a loved one. With notes of cinnamon, clove and orange, this really is Christmas in a candle. 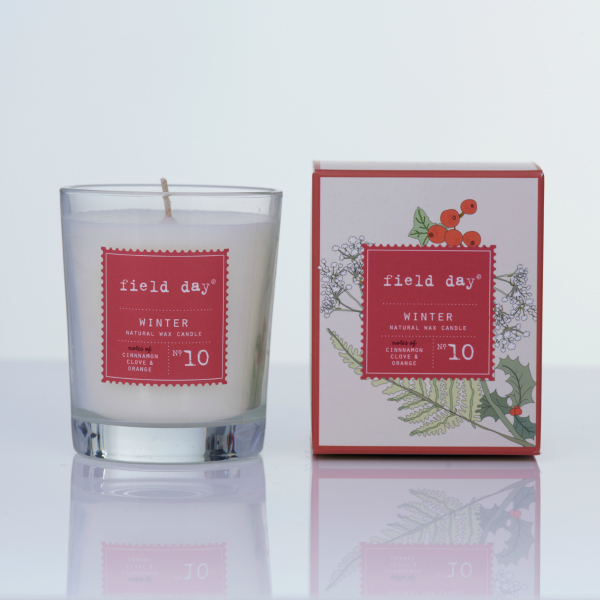 But unlike other seasonal candles, Field Day Winter fragrance is not cloying in any way. Customers have told us that they can't bear other Christmas candles after burning ours - that our candle is so beautifully natural and a pure pleasure to burn. What wonderful feedback to get! Our winter Christmas candle will only be available for a limited time online on this link and via our stockists nationwide. Contact us to find our where your nearest stockist is.